Protein-eriffic (Giveaway!) | Honey, I Shrunk the Gretchen! UPDATE: This giveaway is now closed. To see the winner announcement, please click here! The following post is sponsored by Pure Protein. I am receiving a stipend for my participation in this campaign, but all content is–as always–100% my own. Check out great ways to Eat Good and Look Great at their website. So, protein. Admittedly, as a self-professed carb lover (addict?) for, ummmmm, my entire life, protein has never been at the top of my diet priority spectrum. I mean, sure, I always knew it was important in a “duh” kind of way. And, sure, I like to eat steak and chicken and tofu and all that good stuff. But before starting this blog (and my weight loss/health journey in general), I never really gave a lot of consideration to how much protein I was really consuming. Nor did I consider how much I SHOULD be consuming. And even now, two and a half years into my journey, I still struggle. Despite my best efforts to make my plate balanced, I find myself constantly falling back into the pattern of a VERY carb-centric diet. And that certainly isn’t conducive to my weight loss: protein is proven time and time again to be critical for weight loss–helping elongate your periods of satiety, keeping your blood sugar stable, and generally just being a good USE of your calories. So when the opportunity presented itself to try out some of Pure Protein’s products, I had a kind of curiosity epiphany. After all, I am constantly trying to better my understanding of the nutrients my body needs, as well as what my body responds to, so I figured this would be a good way to test those waters. Now, granted, protein supplements are not, at least in my opinion, a crucially necessary thing to add to your diet. I don’t think anyone is going to make the argument that supplements, shakes, and bars are better than obtaining your macronutrients directly from your food. But there are also plenty of reasons why that’s not always going to happen. For many, it may be as simple as being too busy to think about protein when making dinner, since it’s just faster to make spaghetti. I figured, why not give these things a go and see if they would be a fitting addition to my lifestyle, especially now that I’m getting back into going to CrossFit and upping the fitness ante in general. Enter the protein supplement. Pure Protein sent me a package including a big ol’ tub of protein powder, a few bars, and some protein shakes as well. So I spent the holiday weekend taste-testing the products and seeing if I felt they helped me stay fuller throughout the day, kept my energy up for working out, and the like. Verdict? Mixed, definitely mixed. Pretty evenly split, actually, in terms of the good, the bad, and the meh. For the sake of ease, I’ll break this up into reviewing the three different products I was sent. First up: the protein bars! I was sent both the peanut butter and a chocolate flavors. I actually only ended up trying the peanut butter one, because I felt like the chocolate-chocolate one might end up being a little too close to an actual chocolate bar, and I gave up sweets for Lent. The bars have 20g of protein (!) and 200 calories, and I actually thought it tasted pretty good. Chewier than your average bear bar, but pretty good. I was actually pretty surprised that it only has 2 grams of sugar (although I’m sure it has other non-sugar sweeteners in it). In terms of satiety, the bar definitely filled me up and made it so I didn’t feel like snacking on anything else between meals. I think for someone with a serious grab-and-go lifestyle, this kind of thing could almost work as a breakfast replacement (after all, you’re getting about 20 grams of protein more than you’d find in a pop tart). They’re also gluten-free, if that sort of thing matters to you (obviously it doesn’t for me, haha). Moving on, let’s talk about the shakes next. 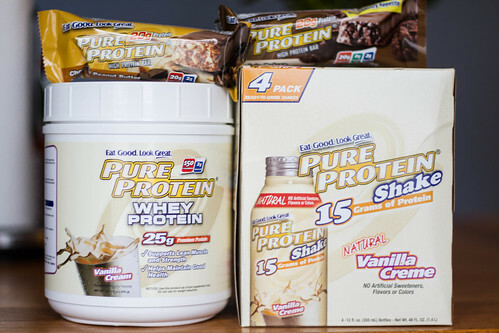 Pure Protein’s shakes come in different flavors and different protein amounts. I was sent the 15g of protein shakes in Vanilla Creme, which is actually the lowest protein amount (they also come in 23g and 35g). Soooo, I won’t lie, I really did not like this one. Maybe it was the flavor or the consistency, but I’m pretty sure I actually made a face when I first tasted it. It reminded me of watered down Slim Fast, which has negative connotations for me given how many of those things I drank back when I was in middle school and thought I was too fat (oh, if I’d only known then…!). Maybe this shake would be better in a different flavor, but as I was only given one flavor to sample, that’s all I’ve got. The shake is 170 calories for the whole bottle, and includes the aforementioned 15g of protein, but there’s also a LOT more sugar than in either of the other products (25g!). It was definitely the most disappointing of the three products for me. However, I have better news when it comes to the protein powder. Now, confession, this is literally the first time I have ever used protein powder before. 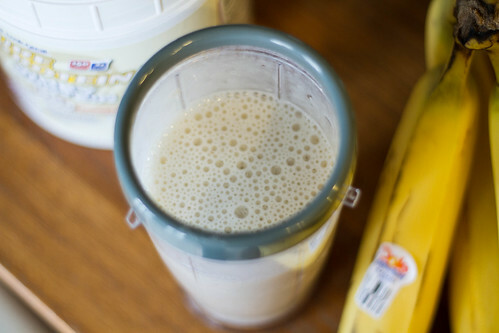 I’ve seen a lot of other bloggers that use it, and I’ve seen lots of smoothie recipes that include it, but I’ve just never gotten around to trying it for myself. Well, I have to say, I’m pretty pleased with my first experience! Pure Protein sent me a big ol’ honkin’ thing of Whey Protein Powder, also in Vanilla Creme. Thankfully, I enjoyed the flavor MUCH better this time (possibly because there were other flavors involved). I made myself a smoothie that included a banana, almondmilk, ice, and half a scoop of the powder, and it was really good! If I’d had some spinach laying around, I would have totally turned the thing into a green smoothie. The protein powder is 150 calories for a full scoop, with only 2g of sugar, and adds 25g of protein to whatever you put it in. So, with my half-scoop, I ended up with a 75 calorie, 1g of sugar addition to my smoothie, which was about 120 calories with the banana and almondmilk on their own. I can definitely see myself utilizing it to add extra protein to smoothies, which I tend not to make a lot in the past because I don’t find them filling enough to warrant the A) calories or B) time spent cleaning my blender. But this concoction absolutely worked for me as a breakfast smoothie. So, my feelings overall on the products? The powder itself is probably the only one of the three I can see myself adopting into my lifestyle, since I really enjoyed both the flavor it added to my smoothie, and the flexible utility of it. I also really like the suggestions on the back of the tub for how to use the powder other than in smoothies. They suggest adding it to oatmeal or pancake mix, and since you know I’m all about finding ways to boost the nutritional impact of foods that are otherwise not super-nutritious, I think those are both great ideas. As for the other products, you already know how I felt about the pre-made shakes (read: not good), but depending on how much convenience food you eat anyway, or if you have a specific reason to really amp up your protein intake (are working out heavily, weight lifting, etc), I can see how the bars could be a viable option for some. And Pure Protein does produce “natural” versions of all their products, if all the fakey ingredients are a problem for you. But why take my word for all of this, when you can form your own opinion? 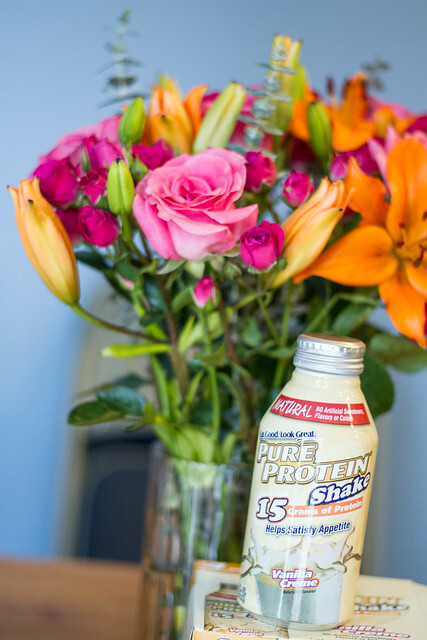 I have a Pure Protein prize pack to giveaway to one of you, which includes several full-sized versions of all the products mentioned in this post! To enter, simply leave a comment on this post answering the question: What role does protein play in your life? Is it something you already take care of, something you know you should have more of? Do you find it difficult to get the required amount of protein in your diet? I’d really love to know where everyone else stands! As always, extra entries are granted for those who follow me on Twitter, Like me on Facebook, or blog/Facebook/tweet about this giveaway! Just make sure you leave separate comments for each thing you do to ensure your extra entries are all counted. The random winner will be selected on Monday, February 25th! I’m in the same boat as you- I’m a carb lover who could (and has) happily eat nothing but bananas, pasta, and bread all day. I started weight lifting about a year ago to lose weight, and realized I needed to increase my pathetic protein intake. I’m eating more chicken, eggs, tofu, greek yogurt, etc. But protein powder has really helped me as well! 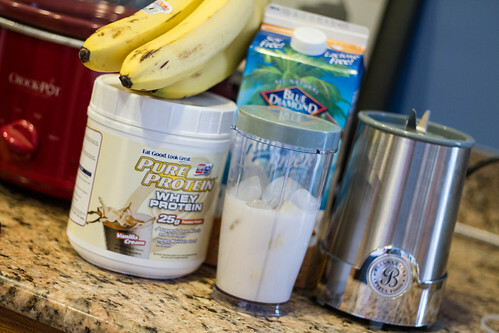 I primarily use protein powder for a quick protein fix right after a workout. I put a scoop into blender bottle and drink it on the way home from the gym, following a strength training session. I’ve heard that the 30 or so minutes right after a strength workout are crucial for getting protein into your body, and it’s a heck of a lot easier than bringing chicken or even yogurt to the gym. I also love to mix protein powder into oatmeal at breakfast. A half scoop plus some peanut butter added to plain oats makes for a very filling breakfast. I’ve only tried a few brands/flavors but so far my favorite is optimum nutrition in mocha cappuccino. I’d love to try this brand! I also just followed you on twitter! i’ve been making a concerted effort at adding more protein to my daily intake. i’ve actually started eating Luna protein bars for breakfast, the choco mint and cookie dough are pretty great! I’m protein obsessed! I get it from my mom. When we were kids and said we were hungry, she always asked us what kind of protein we wanted. It was an easy transition to thinking about protein in a weight loss frame of mind! I always try and eat some sort of protein with every meal and snack, but it takes a lot of planning. I usually aim for about 90-100 g of protein a day on a 1200-1300 calorie diet. It’s tough! Protein is hard for me to get in, too, so I actually use protein supplements quite a bit and would love to try these. I recommend adding some of the powder to oatmeal. The taste blends in well and it gives my breakfast some extra oomph! So I actually think those PureProtein bars are wayy too thick and heavy! However, I am training for the Boston marathon right now and I’m trying to incorporate more protein into my diet, since I rarely eat meat. I’d be willing to try them again, and would LOVE to try the protein powder. Protein plays a support role in my life. Like you, I am very carb-centric but I try to make sure that I have protein included in various ways. I think that breakfast is the hardest place to get protein on average. Lately, I’ve been opting for the Special K Protein + cereal and that seems to help. For snacks, I have been steering towards almonds and a banana in the morning and pistachios with a clementine (or two) in the afternoon. Lunch and Dinner always have meat involved, so I’m not sure that protein is a problem there, but carbs are definitely still the star. As far as cleaning your blender goes, just put in some hot water and a drop of soap, put the lid back on and pulse it for a few. Then rinse it out and you’re good to go. We frequently have smoothies in our house and I’ve found that’s the easiest way to clean under the blades and make sure it’s spotless. Working out in the military is key. Not only do we work out right, we eat right as well. To enhance our gains, there is a huge consumption of protein, but not in a bar format, more in the protein shakes. Replace your snack with bars on the go and soldiers are set. Would love to provide my guys with protein bars to snack on while on missions! Like you, I have just started to get into protein powder. I am really liking it because as you said, it really pumps up smoothies to make them a more viable meal option. I also really like it on its own (mixed w just water) as a post-workout pick me up! I find that I have to think about how much protein I am getting! I already Liked you on FB! Oh, protein! I track all of my food on Sparkpeople and protein is one of the things that I make sure to get enough of each day. I make a point of having protein in each meal, whether it be greek yogurt, veggie burgers, and even a cheese stick to balance everything out. I know that protein will be much more satisfying that a whole sleeve of crackers…not that it stops me from eating the crackers! What role does protein play in my life? ARE YOU SURE YOU WANT TO OPEN THIS CAN OF WORMS, GRETCHEN? Needless to say, my ten years of vegetarianism made me pretty neurotic about protein; supplements like these popped up often in my diet, but I always felt guilty and unnatural about them–a high-fat, high-carb shake or bar wasn’t exactly the best way to balance the three peanut butter and jelly sandwiches I ate that day. Since I’ve hopped back on the poultry bandwagon, my relationship with protein has become a lot less terrifying. I’m getting the animal protein my body craves for energy, and (as evidenced from http://armypantsandflipflops.com/2012/09/17/nothing-says-happy-birthday-like-baby-wipes-and-brownies/) I like to play around with protein powder when sending my deployed husband-to-be baked goods. Jonathan is a protein supplement fiend. On days when my meals are largely made of spinach or if I’ve been hitting the gym a lot during the week, I often use a protein shake for a meal supplement. My current favorite is vanilla soy milk with banana, a tablespoon of flavored Greek yogurt, cinnamon, (ice), and protein powder (I’ve only got chocolate now, but would way prefer vanilla SO I NEED TO WIN THIS). I like your face on Facebook. @Army_Pants enjoys your schnauzer pics on Twitter. And you’ve given me an idea for a protein-inspired St. Paddy’s day care package to Afghanistan, which I’ve now tweeted and am all in a tizzy about. I use protein powder at least once a day! I love using it in smoothies and am starting to branch out to use it in other ways too – like I made some homemade lara bars with protein and I saw a blogger who used it in hot cocoa so I had to try that too. I would really like to try baking with it but I’m a little intimidated. i have to make a conscious effort to get enough protein each day! i like to add protein powder to smoothies because it keeps me fuller longer–as a law student, sometimes i have to go hours in between meals if i get in a studying groove! I love carbs! lol But I make a concerted effort to get protein into my diet, especially after working out. I love using protein powder in smoothies, but I haven’t bought any in a very long time. Since I started lifting heavier weights and taking Crossfit, I have also tried to incorporate more protein. Small steps at first – greek yogurt, eating more meat (not a huge fan), eating beans…but have now started thinking of a protein supplement. I have tried some protein drinks for after workouts and it seems ok…would be curious to try these out! I know I feel best when I am getting in enough protein, especially since I have started lifting more! It is something I am constantly monitoring. I used to eat mostly vegetarian and ALWAYS struggled to meet the minimum recommendation for myself. Now I am eating more paleo-style, and still can be on the lower end of the spectrum. I guess I just love vegetables too much, need to make a little more room for protein! I’d love to give these products a try. I love how low in sugar the bar and powder are! My husband always makes fun of me because I freak out whenever something doesn’t have “enough” protein in it. So if someone offers me just a pastry for breakfast, my first thought is, “WHERE’S THE PROTEIN?!?! HOW WILL I STAY FULL?!? !” So, yeah, obviously I’m a freak about it and try to make sure I have an adequate amount in every meal to stay full! I feel like I do get an adequate amount, and I try to eat protein from non-meat sources too, like tofu, beans, quinoa, eggs, etc. Also, I liked you on Facebook! I’m still working on finding a good balance re: getting enough protein but not too many delicious, delicious carbs. I was a vegetarian for a long time and ate a LOT of beans, lentils, etc. I still do, actually! But since I started doing more weights-oriented stuff in the gym, I’m definitely thinking about protein more. After a hard workout, I want to go home, eat a steak, and go to bed. I don’t, but I want to! I definitely should be adding more protein into my diet or at least some with every meal. I enjoy adding protein powder to my smoothies, but it can be expensive and I’m not really sure what I should look for in a powder. Sooo I am doing this thing called the Velocity Diet 3.0. For a month, you eat 5 protein shakes a day, replacing every meal. For those first 4 weeks you can replace one shake per week with a Healthy solid meal (chicken/fish, veggies, etc). You also weight train 4 times a week at pretty intense intervals and walk 3-4 miles a day. Weeks 5 and 6 you slowly wean yourself off the shakes for every meal. I am over halfway through and down over 10 lbs and many inches. But seriously, the thought of having to choke down another protein shake in the next hour makes me shudder! So, what role does protein play in my life? Well, it is literally keeping me alive for the month of February! 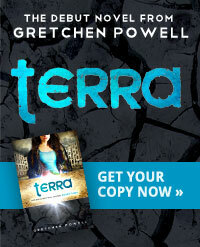 You are already liked on Facebook, and your book rocks so far! I don’t think I get enough protein and have been trying to up my intake of fish, lean meats, nonfat yogurt, etc., to try to get more. I even tried sardines, and the verdict: not in love. I’ve also incorporated some protein powder in smoothies and the like in the past, but haven’t found one that I’m crazy about, and I worry about the sugar and chemicals in some of those. 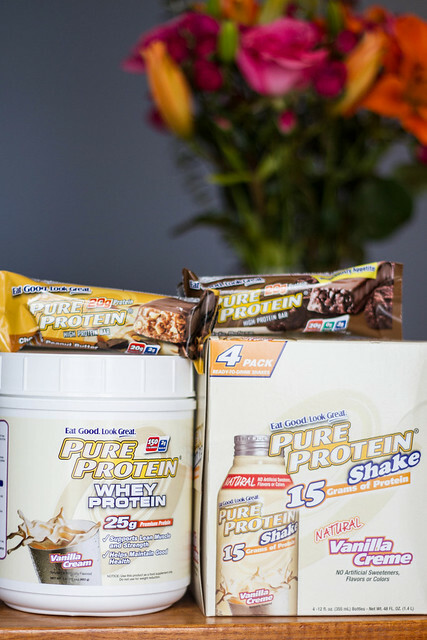 I like to mix up my protein sources, alternating vegan and whey… The pure protein brand is DELICIOUS!! I try to eat protein with every meal & snack but it is not easy! I absolutely love carbs, but I don’t love the blood sugar swings that they come with. I’m also hungry often so I do make it a priority to get some protein in with each meal. I have eggs, nuts, chicken for the most part. My biggest struggle is resisting the free food they have at college, which tends to be nutritionally void. Bah! I am TERRIBLE at getting enough protein, which is terrible for a runner! But surprisingly, my favorite ways to get protein don’t come from meat products. I am a huge, HUGE lover of eggs, almonds, edamame and beans. Seriously, if I didn’t love cheeseburgers so much, I could totes be a vegetarian. I’m consciously trying to incorporate more protein into ALL of my meals, so this week I’ve been making hummus wraps with cheese, hard-boiled egg and chia seeds. Like you – I’m a total carbaholic. I have to really work to get my protein intake up. It is definetly something I know I need to get more of because towards the end of my workout I am starving. I am currently trying new ways to incorporate more protein into my diet. Still “like” you on FB. Always trying to get more protein in my diet. I actually use Click, which is an espresso chocolate flavored protein mix. Very yummy! Protein is big for me, mostly because I know it helps with hunger. I always try to make sure I have some kind of protein with meals and snacks. Even if I’m doing oatmeal in the morning, I will whisk in egg whites. I’ve been toying with adding protein powder but don’t want to spend $$ if I don’t like it. I follow you on Twitter (@healthy_strides). Coincidentally, I am considering barbaric surgery so shakes such as these will be my main source of protein in the first couple of weeks! I usually get enough protein in my daily diet, but have always wondered about the powder. I’d be interested in trying it. It’s something that I’m working at to try and ensure I get enough of… but it’s definitely tricky! Trying to incorporate more in my diet, other than a piece of chicken at dinner. Greek yogurts & The Biggest Loser vanilla protein powder is something new I’m trying. I don’t eat red meat, so getting protein in my daily diet is very important and I often look for other (non-meat) ways. These bars and shakes seem like a great alternative. I absolutely LOVE Pure Protein!!! I actually like their shakes. I have the 23g of protein ones as a dinner when i get home late from working out. 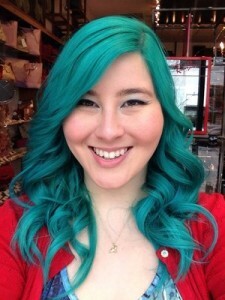 I’d love to try their other products that I haven’t yet! I think protein pays a HUGE role as far as building muscle and keeping yourself full! I try to make sure to incorporate protein into every meal. I have definitely become more protein conscious over the last year or so! I find the protein helps me a lot not just in terms of dieting, but in my mood. Even if I’ve theoretically eaten enough in one day, and even if I’m not feeling especially hungry, I sometimes notice that I feel very…squeezed. Tired and stressed and mopey without real reason. Usually if I have some protein (especially something salty–sugar-free peanut butter with an extra sprinkle of salt on top?) then my energy bounces back! Protein is very important in my trying to lose weight because I actually get really headachey when I’m watching my calories, if I don’t eat enough protein. I am seriously off the diet wagon, in a bad way, and I could really use the help in getting back on track. I currently get a decent amount, but I should definitely try to get more protein – I find myself making spaghetti or other time-saving meals that don’t require the extra effort of grilling/cooking some sort of meat when I’m in a hurry or feeling lazy. Protein powder would be awesome! I think I usually end up at the low end of the recommended daily intake of protein. I have experimented with some protein bars and powders intermittently in the past, with not great results…sometimes the taste just can’t be overcome. Never tried Pure Protein though. After going GF last year (I had a lot of inflammation in my colon and this seemed to do the trick!) I’ve been a lot better about eating protein, especially since wheat was such a large part of my diet and I was feeling hungry all the time without it! I get protein from “natural” sources, like eggs/fish/lean meats, but I also like having smoothies with an protein boost post-workout. I’ve been wanting to try out some whey protein powder but haven’t wanted to invest just yet! Following you on Twitter as well now!! I would probably use the bars more than the other products. Easy to put in my purse for emergencies. protein LOVER! love a good shake after a workout! Protein is something I’m always conscious of. If I’m trying to lose a few pounds, I always up my protein which helps me feel full and keeps me from snacking at night. Works everytime! Not always easy as sometimes I just want a bowl of oatmeal vs eggs but I know it’ll make me feel better all day. I find protein is the focus of most meals. Eggs for breakfast, chicken topped salad for lunch, steak n veg for dinner. Protein is the best! I recently starting trying to get more protein in my diet, but am finding it challenging since I live in a co-op on my university campus. I also started making green smoothies recently and would love to try out the protein powder to boost the nutrient content. What a fun giveaway, I had no idea the bars were gluten free or I would have tried them earlier. I incorporate a lot of protein every day (or I try to!) I love to incorporate some type of fish protein every day, whether it is smoked clams (a current favorite), smoked trout (another perpetual favorite) or even sardines (I will absolutely admit that…) I also try and have a smoothie on the weekend when I have more time, I love to make them milk shake consistency and delicious! I try to get my protein in because it makes me feel fuller and more satisfied than if I eat something carb-heavy. Wow! Great giveaway and it made me really think about what I need and what I eat. I hadn’t even really considered it before – i had used some protein powder in smoothies, but didn’t even know how much I was getting/needed. So apparently according to a calculator I found online, I should get 64-120g a day. I checked on myfitnesspal, and it looks like most days I get the 64, but I could definitely stand to up the amount a bit! Thanks for hosting! Protein keeps me full for so long! I don’t take many supplements with it because I can usually get enough in with my diet…but these products seem like a great addition to my eating plan! I’ve always tried to find ways to sneak protein into my diet with greek yogurt, beans, and random nibbles of chicken through out the day. I still haven’t tried powders yet but maybe a smoothie with protein power would keep me full longer! I am trying (at the request of my trainer) to incorporate more protein into my diet instead of carbs. I would love to give these a try! I am actually trying hard to gain some more muscle so I am trying very hard to increase my protein intake….but I don’t really eat a lot of meat. I tried a protein powder before but didn’t really dig the chalky flavor – maybe this brand would be better! Sigh, protein…love it! I always make sure to have high-protein snacks in the afternoon because that keeps me getting a midday slump. I’m eating Paleo right now, so protein is a huge part of my diet. I definitely struggle to get enough protein, especially on the days that I use weights with exercise. I get bored with chicken and tuna and often crave sweets. A protein powder or bar that tastes like chocolate or vanilla would easily help me up my protein intake, especially when my junk food craving hits late at night haha. Thanks for the awesome giveaway! And I just liked your facebook page! Whee! Protein is SUPER IMPORTANT to me! I eat some with every meal/snack and need to use powder supplements daily to get what I need in each day. I’ve tried lots of powders but not Pure Protein- thanks for the giveaway! Ah, protein! I try to eat as much as a can during the day but I find that I can only church up chicken so much! I totally rely on powders to give me the protein I need and the sweetness I crave! I notice if I don’t get enough protein I start craving other foods that I don’t need (crackers, starchy foods). I feel that I get enough protein in my diet. I use Whey protein in my smoothies quite a bit! I have very little issue getting enough protein, mostly because I love greek yogurt, protein bars, etc. so much and reach to them often for on-the-go snacking. However, while the sheer amount of protein I get is enough, I do worry about getting in the right types to ensure I am getting “complete” protein as they say (the right balance of amino acids), so I’ve been trying a lot harder recently to up my intake of whole grains that have naturally complete protein! I’ve recently become addicted to in-shell peanuts. 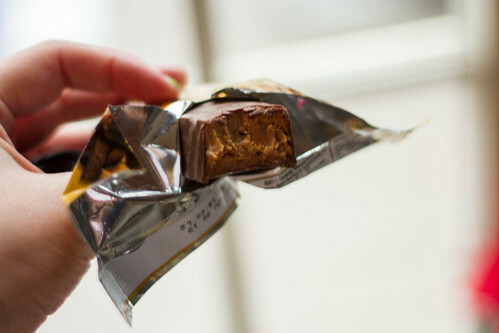 Cracking them open to find the delish protein-packed snacks inside is really kind of satisfying, and because they’re labor intensive, I tend to stick to the portion size more easily than scooping up a handful of shelled peanuts. I’m trying to add in more protein, especially after working out! I try to eat as much protein possible but I don’t really like meat so I normally fall short. I follow you on Twitter as well! Protein is a huge part of my life now! I make sure to have protein everyday now, I love to have a shake or protein bar after I workout, it always makes me feel more energized! !